Try to keep up with the endless torrent of video content on the web each day, and your brain could melt. 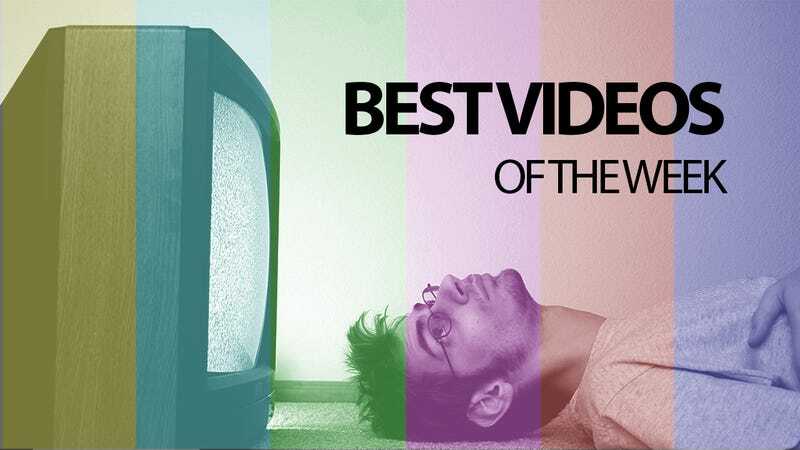 Let us ease your fatigue with a selection of the best videos of the week. Enjoy! Just How Resilient Is a Bulletproof Vest Against Everything Else? In addition to concocting some of the most original and dangerous-looking weaponry the internet has to offer, slingshot master Joerg Sprave also likes to conduct the occasional science experiment. And if you've ever wondered just how well body armor can protect you, Joerg has the answer. This completely ridiculous video of an elderly lady shooting a loaded rifle at a hoard of pristine Apple gadgets will make you feel many emotions: confused, horrified, skeptical, surprised, and amused. You're about to watch a beautiful music video, which sets a precise yet delicate piano line to one of the most wonderful pieces of scientific footage you've seen in a long time. Microsoft had one of the biggest product announcements in the company's history this week: Surface, the machine that will take on the iPad and the MacBook Air. But since only a handful of tech journalists were invited—and since we're guessing you don't have an hour to watch the full thing—we've chopped a video of the whole thing down to just the good bits. LeVar Burton was the king of a generation: First, Star Trek's Geordi La Forge, and then, the guy who taught us to like books on Reading Rainbow. Now, the two Burtons are fused—and it's pretty incredible. If you've ever wondered how McDonald's manages to make its burgers look so much more appetizing in the pictures than they do in real life, your appetite will be satisfied with this fast look at food photography. Action cams have always sounded great. Just strap them to a bike, a surfboard, a car, or a helmet, and record a ride from the daredevil's POV. Now they're getting fancy, with full 1080p HD recording, Wi-Fi, Bluetooth, and GPS. So which is the right one to capture your classic runs and epic wipeouts? Watch this landing of a Boeing 767 from All Nippon Airways. It's pretty rough, with the nose gear violently bouncing off the runway. Then it gets spectacular. Keep watching to the end, past the 0:33 mark.